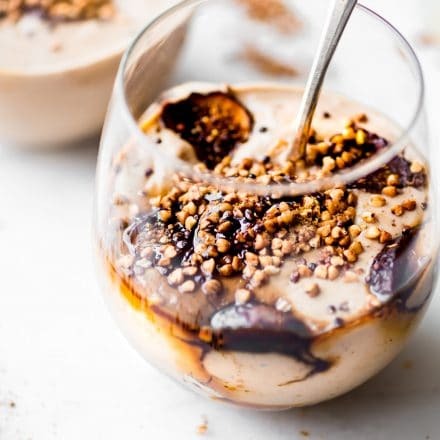 Creamy Fig Yogurt Breakfast Parfait Cups! 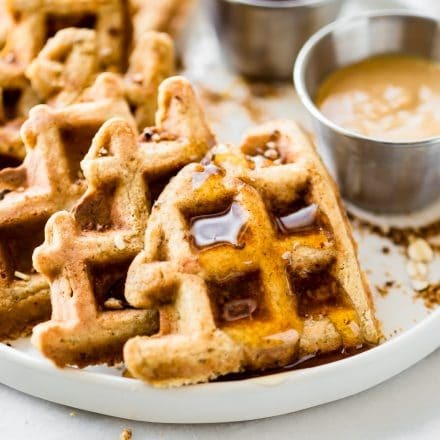 A healthy gluten-free breakfast with a boost of fiber! 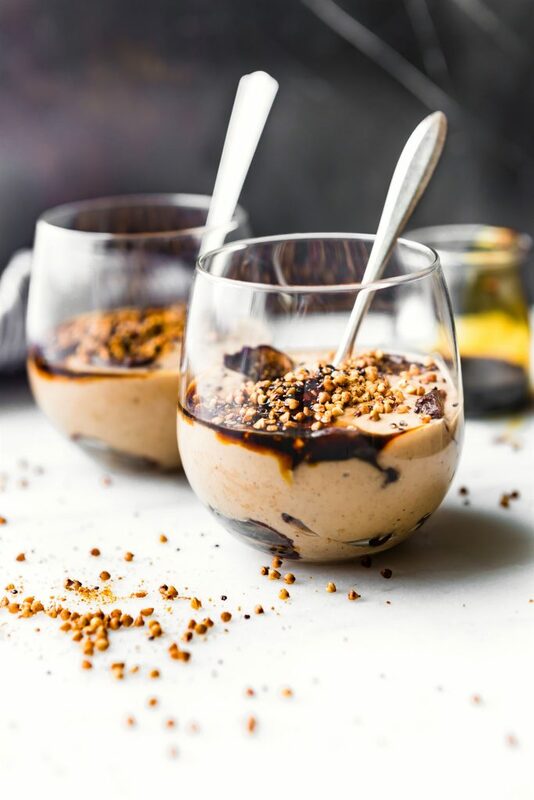 Blended yogurt cups with dried California Mission Figs, chia seeds, a drizzle of molasses, and a cinnamon toasted Buckwheat topping! Ya’ll, this is so heavenly! 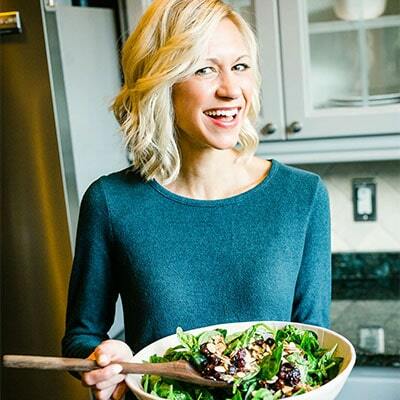 Simple ingredients, energizing, quick to make, and oh so deliciously good! 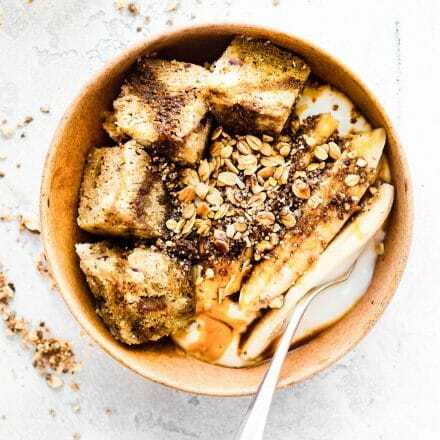 Do you know what happens when a creamy smoothie and power breakfast bowl collide? They make yogurt parfait cups! The offspring two of the best breakfast foods. Okay wow, that’s UBER corny. But it’s truly the best way I can describe this fig yogurt HAVEN! Now, ready for the real story? Mmm k? I had full intentions of just updating this fig newton breakfast smoothie, because yes, the pictures make me cringe. But then I started reading the post and the recipe and I thought to myself. Oh no no no, we need to do better than this. I can’t update this. I need to REDO the whole recipe and make it better, like stat! My OCD tendencies shining bright ya’ll. So that’s what I did. 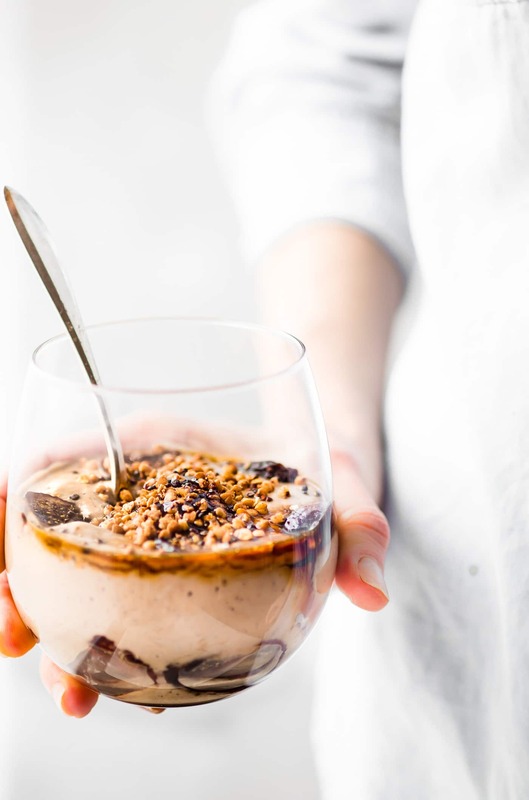 I revamped the whole recipe using crunchy ancient grains as the topping, California Mission Figs, and much more nutrition packed into that little yogurt parfait cup. Mmmm mmmm, blended yogurt with fig filling and a cinnamon toasted topping! I think you’re going to like this. “I like it ah lot.” –> Name that movie. Okay okay, the PARFAIT part comes from the cinnamon toasted buckwheat groats. Which you will become obsessed with. I promise! More on that later. But first… FIGS! Gah oh how I love thee! Especially dried California Mission figs! They are delicious. They are packed with so much nutrition! I’ll go ahead and put on my Corny Cotter hat for this next saying. Good source of fiber. A 1/2 cup of dried figs packs close to 30 percent of the daily value for fiber. Dried figs have high levels of vitamins and minerals, this means more antioxidants ya’ll! 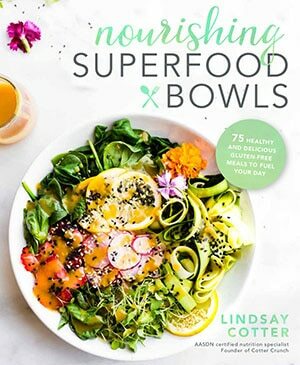 SUPER NOURISHing. They are a natural Sweetener. Fig paste is a great sugar replacement in baking and in my case, breakfast parfaits! 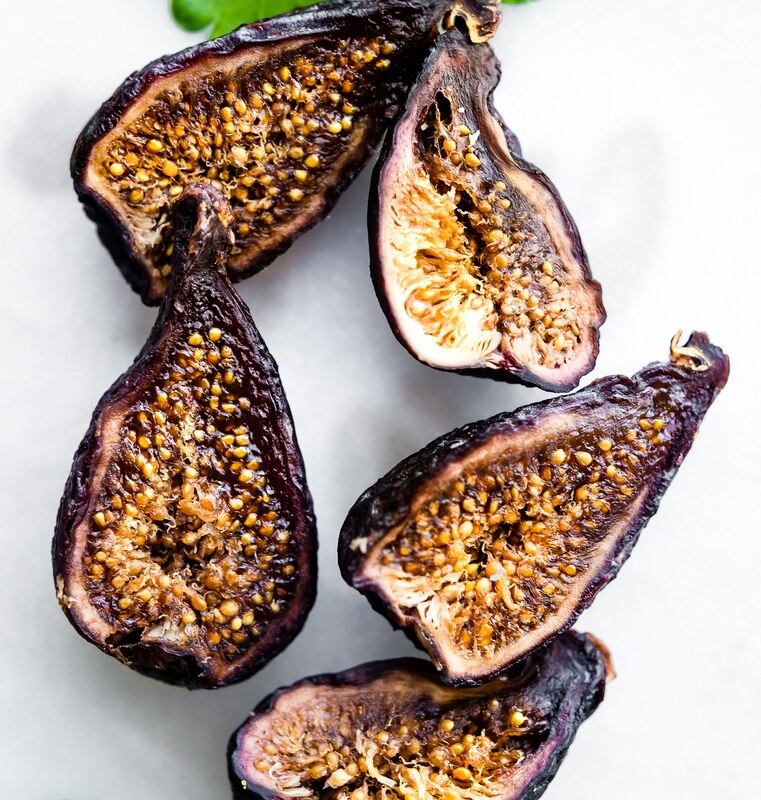 What I also really like about Figs is that they are a great replacement for banana in recipes (nutrient wise) and they give it recipes more bulk. I love banana but I can’t tell you how many people I know that actually don’t like banana, yet still need that potassium. Figs are a great source of potassium, similar to that of banana. 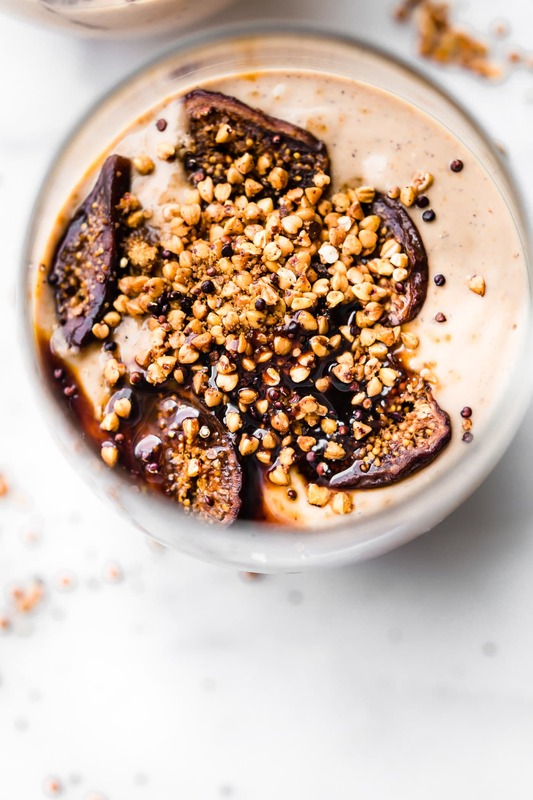 Which is another reason why I added FIGS to this smoothie! Now that we’ve chatted enough about figs. I should probably tell you what’s in the rest of fig yogurt parfait cups, right? That top coating and ancient grain is the cinnamon toasted buckwheat! And like I mentioned above, you’ll be hooked at toasting buckwheat after tying this! Just a little coconut palm sugar, cinnamon, coconut oil, and buckwheat groats is all you need. They toast up in 5 minutes. They also “pop” in your mouth when you eat them. Kinda like cocoa crispies, but .. um.. way healthier and more crunch! Buckwheat is not a wheat, in fact, it’s not even a grain! Buckwheat is a seed from a plant that can survives in cold climates. And it has amazing nutrients! It’s high in amino acids, calcium, B Vitamins, and it’s slow to digest. Which means it’s going to help stabilize blood sugar. Now pair that with anti-inflammatory rich cinnamon and you got yourself a winner of a toasted topping for that fig yogurt parfait. Or at least I think so. Oh and I almost forgot. For a extra dose of iron, drizzle a wee bit of molasses on top of the parfait cups. It’s heavenly! Goodness enough chitty chatty. Let’s eat. Cool? Creamy Fig Yogurt Breakfast Parfait Cups – A healthy gluten-free breakfast with a fiber boost! 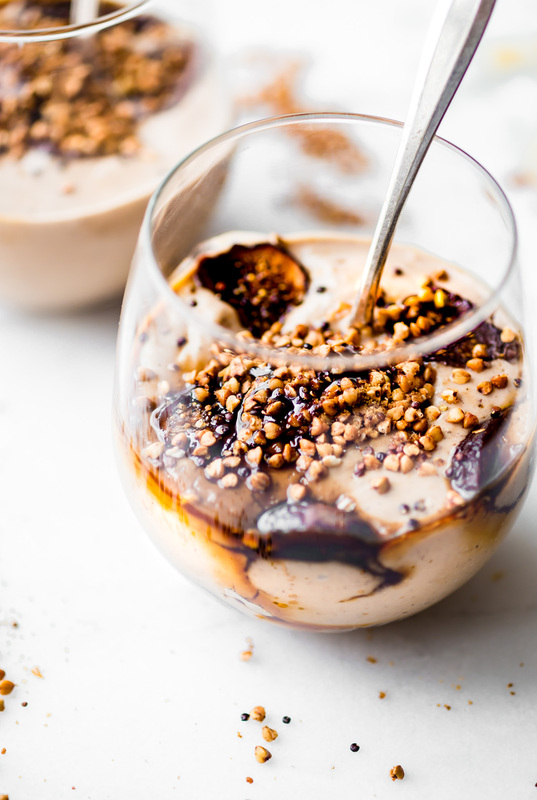 A blended Yogurt Cup with dried California Mission Figs, chia seeds, a drizzle of molasses, and a cinnamon toasted buckwheat topping! 1/2 cup dried figs. Stems removed. Remove stems from figs, slice in half, place in bowl and cover with water and a drizzle of honey. Soak for 10 minutes or so. This is optional but it makes the figs more soft, flexible, and sticky sweet for the parfait cups. Like a fig newton filling! Preheat oven to 350F. While oven preheats, make your creamy yogurt blend. 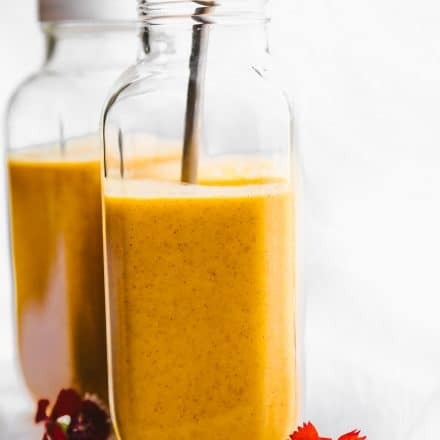 In a blender, blend together yogurt, almond milk, banana, honey, almond butter. Set aside. 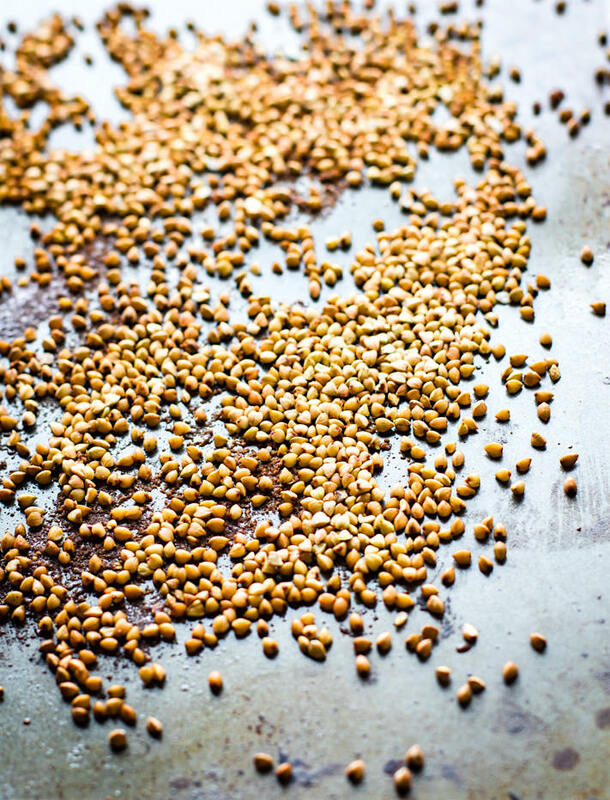 Toss together 1/2 cup buckwheat groats coconut oil, cinnamon, and sugar. See notes of other grains to toast. Toast on baking pan at 350F for 5-6 minutes. Remove and let cool. Place 3 slices of figs (each) into two cups, pour your creamy yogurt blend on top. Layer with more figs on top. 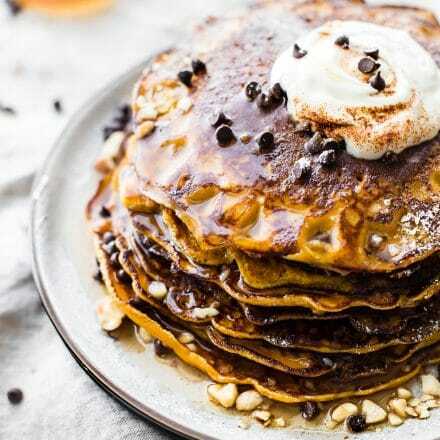 Add toasted cinnamon buckwheat on top, then a pinch of cinnamon, molasses, and chia seeds. Feel free to try this with regular oats, steel cut oats, and quinoa, but take a little longer to toast. Around 10 minutes or so. Check at frequently so you don’t overcook. For vegan option, use coconut yogurt or non dairy yogurt of choice. If you are fig newton fan, then you will LOVE these fig yogurt breakfast parfaits. Taste so similar!! Favorite breakfast? Any other buckwheat or fig recipes you got? Oh do share! Fig Yogurt Breakfast Parfait Cups! A healthy #glutenfree breakfast with a fiber boost! Fun fact: I grew up with a fig tree in my back yard. Until it tried to (and was successful in doing so) growth THROUGH a maple tree next to it. And then they both had to get cut down. Le sigh. What a sad story. Maybe they are hanging out in tree heaven. LOL! Figs are hands down my favorite dried fruit! you don’t have average to give me a reason to make this yummy parfait with some coconut milk yogurt – delish! yes! coconut milk would rock! or Kite Almond milk yogurt! looks more like a dessert and i will take 2 please! You got it! come for breakfast? Mmm…. Wow I love the sweetness of figs. I think I’ve had them once or twice, but I haven’t seen dried figs here. These look so good and creamy and delicious. really? Go to your local grocer! I bet they have the califlornia mission figs! I’ll send ya some if not! You should try toasting those! You ready bro! Been thinking and praying for you tomorrow!!! You’re the best, brother. Thank you. oooo.. this looks gorgeous. I like dried figs… I LOOOOOVE fresh figs. Unfortunately, I rarely see them at the market around here. Oh bummer. Where do you live? I see them in our markets now. But it’s brief! This looks fantastic! Figs are one of the best fruits of summer for sure – love how you used them in here with all those other rich flavors! I approve of your OCD tendencies. Because, damn does this look good. Love the crunchy topping. I want this every morning during fig season! Forget coffee as the best part of waking up! 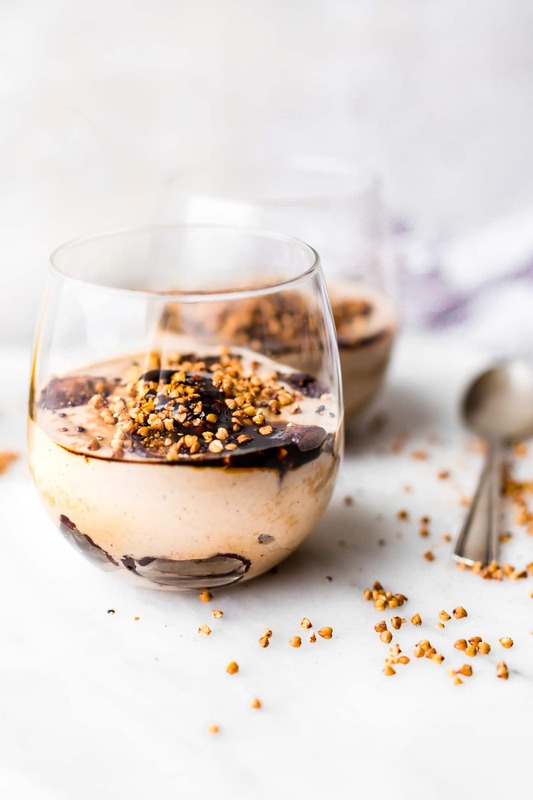 I’d hop out of bed to eat these delicious looking parfaits and the fact that they taste similar to my childhood fav fig newton bars is a huge bonus. LOVE these yogurt-breakfast-parfait-cups!!!! so pretty and they look so delicious! These are just so pretty LIndsay- i am glad your OCD came out for these! Figs are the best- I am all over this! We were talking about figs the other day. They’re one my all time favorites, so I can’t wait to try this! Mine too! FIGTASTIC. Ya, i’m so corny..
Those figs look amazing Lindsay! And these parfaits would make the perfect breakfast or any time of the day snack! So loaded with goodness! Totally! I’d eat your peach praline for breakfast. hehe! YUM! This is such a great eggless breakfast!! You had me at figs + honey! I friggin loved fig newtons!!! I love figs too!!! Figs are truly one of my most favorite fruits. I love this breakfast parfait so much! oh great idea with coconut! Did you try with the toasted buckwheat too?